As she celebrates a career milestone, the new Susan Gager Jackson Professor of Creative Writing, Cathryn Hankla ’80, M.A. ’82, says that throughout Hollins’ changes, one thing has endured: its creative community. “So I ended up here and I’m still here,” she laughs, referring not only to earning her bachelor’s and master’s degrees at Hollins but also to what is now a thirty-year teaching and writing career that currently boasts eleven published poetry and fiction titles and a number of prestigious awards, including a PEN Syndicated fiction prize and the James Boatwright III Prize for Poetry. I don’t write formulaic books. Every time I start something it’s a new experiment. Whether she’s teaching an introductory or upper-level course, Hankla says her goal is helping students understand writing as a process requiring patience. “It happens in stages—generating ideas, drafting, revising, and editing. You also have to grow yourself spiritually, intellectually, and emotionally in order to write your best stuff. That takes time. You have to be the kind of person who can delay gratification. If you’re not, you won’t stay with it. This comfort with a variety of artistic media—in addition to English, Hankla also majored in filmmaking at Hollins—has led her over the past dozen years to paint. She grew up sketching for fun and kept drawing. “I didn’t call myself an artist, I just drew a lot, but [Professor of Art] Nancy Dahlstrom and I taught a class for ten years beginning in the late eighties on bringing writing and drawing together, and that kept my visual life alive.” With artist Ann Glover she’s collaborated on sculpture, winning an award in the Roanoke Sidewalk Art Show. Hankla’s paintings have been juried into national shows and found collectors. She was a runner-up in the 2007 New American Paintings competition, and her work was selected for Studio Visit magazine (2009). Jeff Hodges is director of public relations. 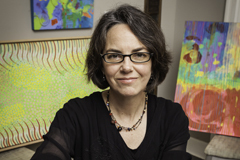 An award-winning writer, Hankla is also a successful painter.